Sweating is an essential function of the body; it helps cool the body, moisten the skin and excrete metabolic wastes. How much you sweat depends on how many sweat glands you have and how active they are. The way you sweat is also influenced by your mood, diet, hormone level, some drugs and medical conditions. Generally, women have more sweat glands than men, but men's glands are more active. Either excessive or too little sweating is abnormal. Over 1% of the world's population suffers from excessive sweating, medically known as hyperhidrosis. Other than for hot weather, exercise or emotional reasons, these individuals tend to sweat excessively without a trigger. Excessive focal sweating such as on the face, hands, feet or underarms usually has no apparent cause; the condition seems to run in families. However, excessive sweating over a large area of the body may indicate an underlying cause. It can be a side effect of medication or a sign of health problems commonly seen in menopause, low blood sugar, hyperthyroidism, anxiety, cancer and infections. 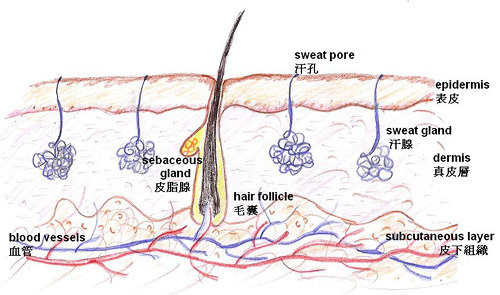 According to Traditional Chinese medicine (TCM) theory, sweat is transformed by yang qi evaporating body fluids especially the blood, which then it emerges out of the body through the sweat pores. Normal sweating helps regulate and harmonize the internal and external body, and is also responsible for nourishing the skin. Sweating has a dual nature when occurring in disease; the first is to eliminate pathogens, a normal reaction of the body's defense system. Secondly, as sweat is transformed from body fluids, excessive sweating depletes body fluids and blood causing further internal disturbance. In TCM experience, sweat heavily over the entire body tends to have a low level of qi (vital energy) which makes people experience chills, breath shortness, fatigue and get cold and flu easily. Insufficiency of lung qi: protective qi, which is governed by the lung, regulates the external body, such as warming the muscles, keeping the skin moist, enriching the subcutaneous tissues, and managing the opening and closing of the sweat pores. When the lung system is under-functioning or there is insufficient protective qi, the skin and its underlying tissues become saggy; TCM regards this as a weakness of the external body, a disharmony called "insecure striae" that can lead to excessive sweating. Furthermore, pathogens like wind or dampness may take advantage of the weakness, further interrupting the distribution of body fluids and blood, triggering abnormal sweating. Hyperactive fire due to yin deficiency: blood and essence are important yin components of the body; if they are depleted, the internal body will become unbalanced and can easily generate fire pathogens. The fire pathogens can irritate the body fluids and force them to emerge out of the body. Yin deficient disharmony can result from chronic illness or an unhealthy lifestyle. Insufficiency of heart blood: TCM claims that blood and body fluids come from the same origin, sweat is a fluid of the heart system. Excessive sweating is considered an exploitation of qi and heart blood, leading to symptoms such as palpitations and insomnia. Clinically, people who sweat abnormally usually have a heart deficiency. If such sweating is spontaneous, the disharmony belongs to a deficiency of the heart yang. If it takes place at night, the disharmony belongs to a deficiency of heart yin. People who overuse their brains tend to develop heart deficiency and store less blood. Stagnant heat evaporating the body fluids: internal heat is often the end transformation of anything causing body disharmony, including invasions of exogenous pathogens, mental distress or improper diet. The heat promotes the vaporization of body fluids, and excessive sweating is a sign showing that the body is overheated and need to cool down. For a consultation about abnormal sweating, TCM physicians pay attention to the location (particular region or entire body), the time (day, night or specific hours), the nature (cool or warm, color and smell), and intensity as well as other signs to create an individualized remedy. Some diagnostic factors are listed below. Sweat is actually colorless and odorless. Food and drugs can cause sweat to have an abnormal color and smell. Moreover, changes can also be due to internal disharmonies disturbing the sweating process. Different pathogens cause different clinical features which help physicians determine the cause of abnormal sweating as well as selecting remedies. Sweating is closely related to the condition of the body. TCM believes that the process also corresponds to the state of blood, qi (vital energy), body fluids, internal organs and the twelve meridians. Based on the order and arrangement of the meridian flow, physicians can identify the internal disharmonies that are associated with focal sweating problems.